This week has been nothing but a series of good things. Another year rolled around for me, I received a glow-in-the-dark Ghostbusters T-shirt, and Ocean FM’s VIP Platinum Club sent me an automated email with a gift certificate of $5 to try out Cakes Etc. Now no birthday is ever complete without cake, and the next day, I charged out of the classroom, down Hillside, and to what’s basically a bakery in the oddest of all areas—an industrial section of town. I was expecting something more eat-in than take-out; there wasn’t enough space for me to surreptitiously grab pics. 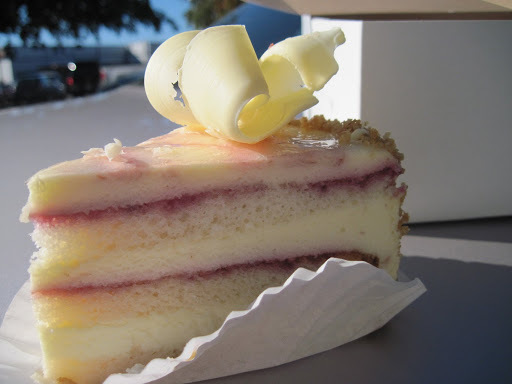 I picked up a slice of White Chocolate Raspberry cake ($3). At first bite, I recognized the flavour of a sponge cake (a genoise) layered on top of two other layers of airy goodness, which was basically a mousse. I very rarely eat cake, and if I was to visit this place again, I can definitely see more than my girth giving away. Thankfully, I have self-control. White chocolate beats dark any day of the week, and I call consumption of that delight a heavenly sin. When I do indulge, I find it tough to buy really good chocolate without it being tasting too sickeningly sweet or overpoweringly strong. At Cakes Etc, it’s just right. Just nibbling on it alone or with the cake is very good. And I noticed the prices for a basic slice is right for the size I see behind the display case. At any other place, near more heavily trafficked areas, I can imagine some other companies charging more. With the other delight I picked up, a hedgehog the size of my fist, I’m saving it for tomorrow. Too much sugar and coffee will have me climbing walls for the whole day. This entry was posted in Food, Reviews and tagged Confectionery, Desserts. Bookmark the permalink.